To get started, just spin up a GPU (g2.2xlarge) instance from community AMI ami-f0bde196 (1604-cuda80-cudnn5110-theano-keras), ssh in as the ubuntu@ user and get going! No hassles. But of course, EC2 charges apply. Reboot. Now, everything should finally work. Exercise: Install TensorFlow on the system as well, release your own AMI and post its id in the comments! Tip: Use nvidia-docker based containers to package your deep learning software; combine it with docker-machine to easily provision GPU instances in AWS and execute your models as needed. Using this for development is a hassle, though. Readers of this blog should be already a little bit familiar with the Ailao brand, which we use for spinning off and commercialization of our academic research. Originally, Ailao was all about text and question answering, but there was always the theme of dealing with unstructured data in general. Nowadays, Ailao is not just me (Petr Baudiš) anymore – but a partnership with Tomáš Gogár and Tomáš Tunys, fellow PhD students! And we are widening our breadth to cover documents in general, developing a machine learning computational platform Ailao Brain (just a codename!) as well as working hard on some exciting end-user products. We are also working on a prettier website (including a new look for this blog) and many other things, but more on that soon. 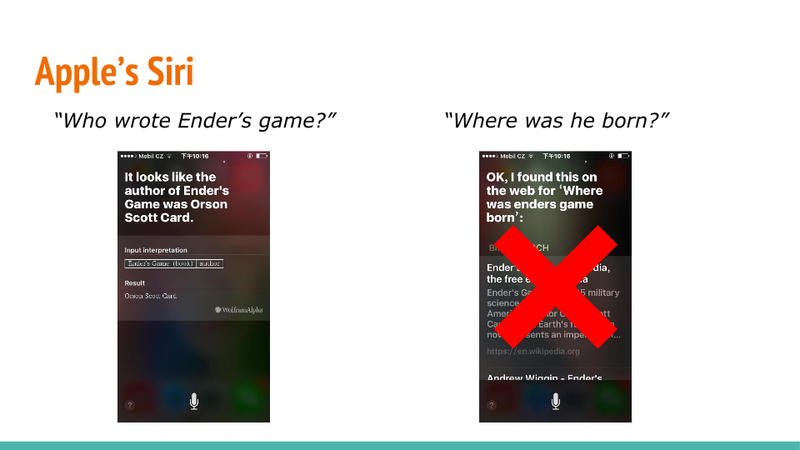 What I wanted to point out is our talk at Machine Learning Meetups Prague. The talk itself (video) is in Czech, but you can enjoy at least our English slides on our bleeding edge technology research (webpage information extraction and text understanding). Stay tuned for more! Everybody driving a car needs the navigation to get to the destination fast and avoid traffic jam. One of the biggest problems is how to enter fast the destination and how to find where are the congestions, what is the traffic situation. 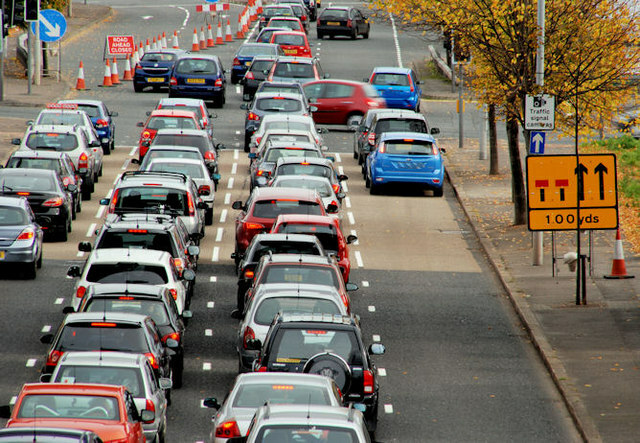 YodaQA Traffic is a project attempting to answer the traffic related questions quickly and efficiently. Drivers may ask questions in natural language like: “What is the traffic situation in the Evropská street?” or “What is the fastest route from Opletalova street to Kafkova street?” You can try out the prototype (demo available only for limited time) – try to ask for example “traffic situation in the Wilsonova street” . YodaQA Traffic still has some limitations. Currently we only have a browser version not suitable for smart phones. It is answering traffic questions for Prague’s streets only. But as usual, this whole technology demo is open source – you can find it in the branch f/traffic-flow of our Hub project. How does it work and where we get the data from? 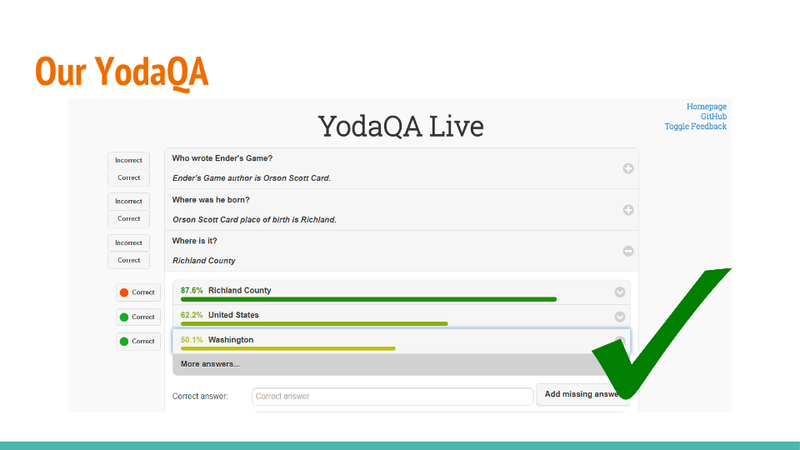 All YodaQA are first analyzed to recognize and select traffic questions. We do it in two steps. The first step is to recognize the question topic. We use six topics like traffic situation, traffic incident or fastest route. 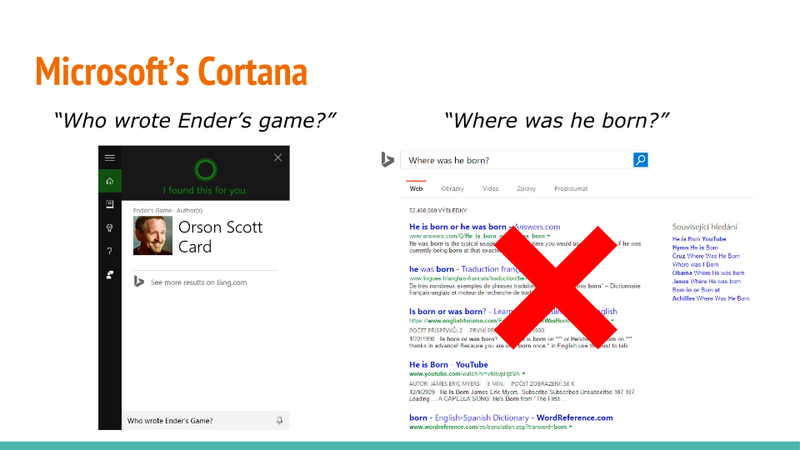 The topic is determined by comparing semantic similarity of the user’s question with a set of reference questions. 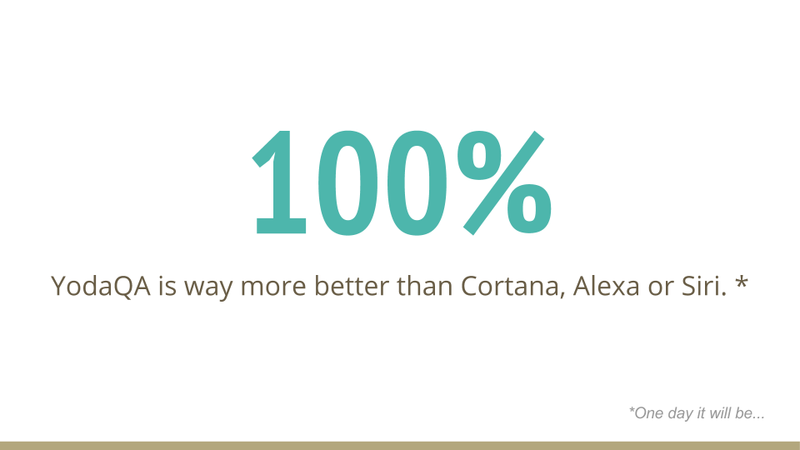 We estimate the similarity with our Dataset-STS Scoring API. Each reference question is labeled by a “topic”. The Sentence Pair Similarity algorithm selects the reference question “topic” with the highest similarity to the question. Next we need to recognize the location, i.e. to recognize the street name. This is handled by another tool called the Label-lookup which we normally use for entity linking in YodaQA. It compares questions words with a list of all street names in the Prague. We exported the list of streets names in Prague from OpenStreetMap. We do not do exact match, we try to select the closest street name from the list. The last step is to decide whether the question is really the traffic question, because the Dataset-STS API and Label-lookup can find topic and street name even in a pure movie question like “When was the Nightmare on Elm Street released?”. The Dataset-STS and Label-lookup return not only topic or street name but also the score, fortunately. We created dataset of over 70 traffic questions and over 300 movies questions and founded the minimal score thresholds, with which the recognition makes the lowest classification error on this dataset. Once we know the type of question and the location we start a small script accessing the traffic situation data from HERE Maps. The only complication is that the the API doesn’t return traffic situation for particular street, but bounding box only. To overcome this problem we have to find a bounding box for a desired location, using an algorithm we developed for this purpose. Then we call the traffic flow API to acquire the information for all streets in the bounding box. Finally, we filter out the traffic situation for the desired street. It was great fun to work on this application, it is not perfect but it shows how to create intelligent assistants helping people solving various everyday situations. We are also excited to see, how the users will use the new functionality of YodaQA and how it will help them. The blog has been a little bit silent – a typical sign of us working too hard to worry about that! But we’ll satisfy some of your curiosity in the coming weeks as we have about six posts in the pipeline. The thing I would like to mention first is some fundamental research we work on now. I stepped back from my daily Question Answering churn and took a little look around and decided the right thing to focus for a while are the fundamentals of the NLP field so that our machine learning works better and makes more sense. Warning: We’ll use some scientific jargon in this one post. So, in the first months of 2016 I focused huge chunk of my research on deep learning of natural language. That means neural networks used on unstructured text, in various forms, shapes and goals. I have set some audacious goals for myself, fell short in some aspects but still made some good progress hopefully. Here’s the deal – a lot of the current research is about processing a single sentence, maybe to classify its sentiment or translate it or generate other sentences. But I have noticed that recently, I have seen many problems that are about scoring a pair of two sentences. So I decided to look into that and try to build something that (A) works better, (B) actually has an API and we can use it anywhere for anything. My original goal was to build awesome new neural network architectures that will turn the field on its head. But I noticed that the field is a bit of a mess – there is a lot of tasks that are about the same thing, but very little cross-talk between them. So you get a paper that improves the task of Answer Sentence Selection, but could the models do better on the Ubuntu Dialogue task then, or on Paraphrasing datasets? Who knows! Meanwhile, each dataset has its own format and a lot of time is spent only in writing the adapter code for it. Training protocols (from objectives to segmentation to embedding preinitializations) are inconsistent, and some datasets need a lot of improvement. Well, my goal turned to sorting out the field, cross-check the same models on many tasks and provide a better entry point for others than I had. 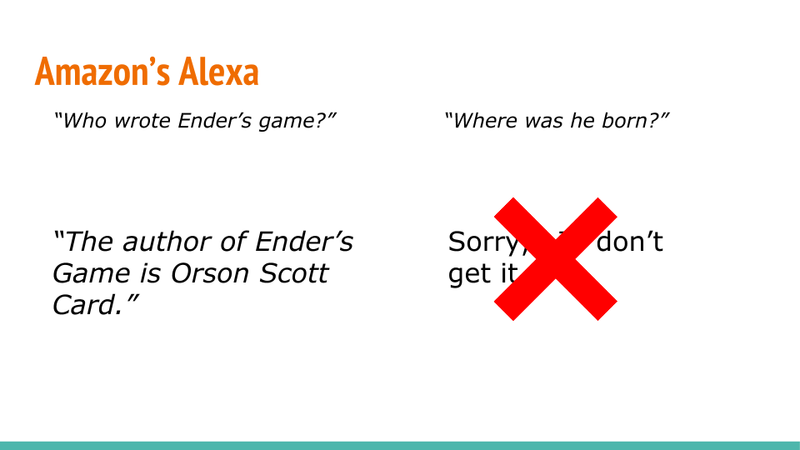 We have a lofty goal of building an universal text comprehension model, a sort of black box that eats your sentences and produces embeddings that correspond to their meaning, which you can use for whatever task you need to do. Long way to go, but we have found that a simple neural model trained on very large data is doing pretty good in this exact setting, and even if applied to tasks and data that look very different from the original. Maybe we are on to something. Our framework is state-of-art on the Ubuntu Dialogue dataset of 1M techsupport IRC dialogs, beating Facebook’s memory network models. It’s hard to compare neural models because if you train a model 16 times with the same data, the result will always be somewhat different. Not a big deal with large test datasets, but a very big deal with small test datasets which are still popular in the research community. Almost all papers ignore this! If you look at evolution of performance of models in some areas like Answer Sentence Selection, we have found that most differences over the last year are deep below per-train variance we see. Please take a look, and tell us what you think! We’ll shortly cover a follow-up paper here that we also already posted, and we plan to continue the work by improving our task and model coverage further, fixing a few issues with our training process and experimenting with some novel neural network ideas. More to come, both about our research and some more product-related news, in a few days. We will also talk about how the abstract-sounding research connects with some very practical technology we are introducing. Studying in Prague? Join us at eClub Summer Camp! Summer Job (auxiliary option, full-time coder) – we need help polishing the edges of some of our projects, seeking students that are skilled programmers. We are mainly affiliated with FEL CVUT, but we also have students from MFF UK and we’ll welcome students from other Czech universities too. As long as you are a competent programmer, want to do something more than yet another Android game, and willing to come in person three times a week – let’s do something groundbreaking together! 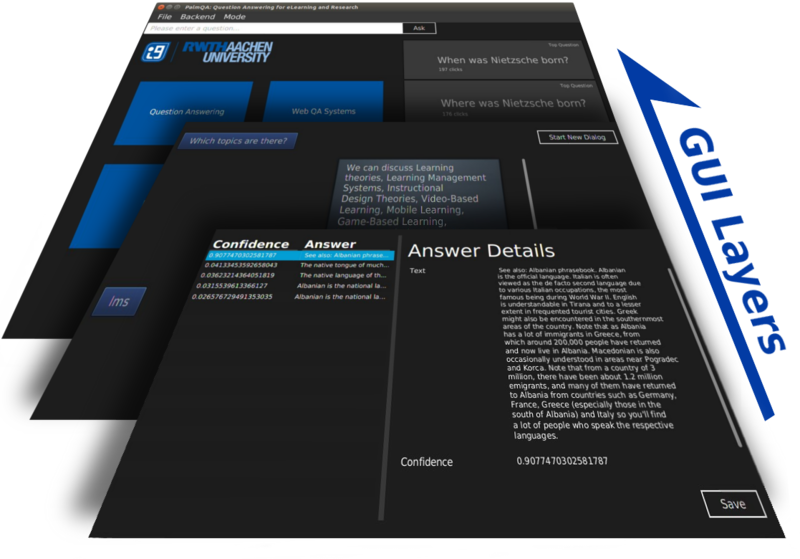 Recently, the YodaQA team is collaborating with Falk Pollok from RWTH Aachen who is interested in using Question Answering in education to help people digest what they have learned better and to generally assist with studying. To this end, he has created PalmQA – a QA application that multiplexes between many question answering backends, ensembling them together to a more accurate system. Falk has built backends for IBM Watson’s DeepQA among others (Google, Evi, Kngine and MIT’s Start), but in the end, the combination of YodaQA and Wolfram Alpha is “a match made in heaven,” as Falk said in an email a short while ago. As a finishing touch to his work (being submitted as a diploma thesis), Falk made a Grand Challenge – letting an independent third party make a list of 30 factoid questions of varying difficulty, and pitching the PalmQA against a wide variety of humans. Perhaps not quite as dramatic or grandiose as IBM Watson’s Jeopardy participation, but still a nice showcase of where we are now. Well, PalmQA did great! 26 people competed, and typically could get about 15 out of the 30 right. The best human answered 24 questions correctly. But no matter – PalmQA managed to answer 25 out of 30 questions right! So, in this challenge, Falk’s ensemble-enhanced YodaQA beats the best human! 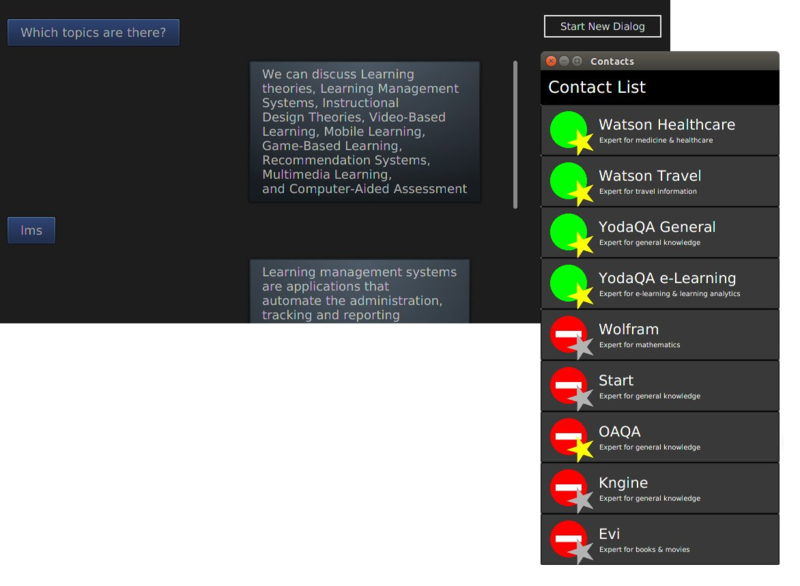 As mentioned above, PalmQA offers integration of YodaQA with Wolfram Alpha, Google QA, MIT’s Start, Amazon’s Evi and Kngine. We hope to merge this ensembling system into the YodaQA project in the future! I also entered just plain YodaQA into the Grand Challenge, in the configuration that’s running at live.ailao.eu right now. It got 18 questions right, still better than an average human! If we also included purely “computational” questions (algebra, unit conversions) that YodaQA just isn’t designed to answer (it’s still essentially a search engine), that’d make 24 questions out of 30. Pretty good! See the Grand Challenge Github issue for more info. We should get the complete details of the challenge, comparisons to other public QA engines (like Google) etc. in Falk’s upcoming thesis. YodaQA learned how to use twitter during easter holidays. 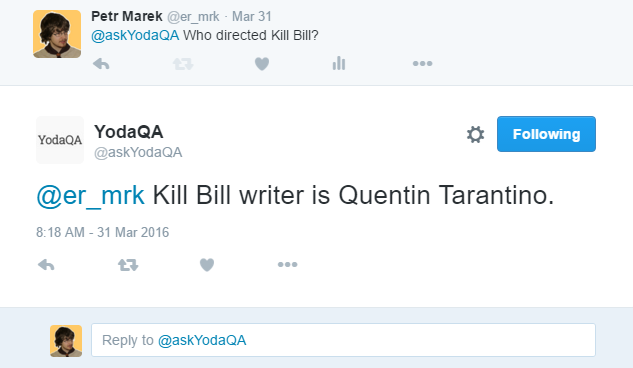 You can ask it by sending tweet with question to @askYodaQA . YodaQA will answer you shortly. How is it possible? I created app in the Google’s App Script, which handles receiving question from twitter and answering them. Why did I create it? YodaQA can reach more users in the new interesting form thanks to it. I believe they will help us to find even more ways how YodaQA can help them. It is pretty symbiosis. YodaQA will help twitter users, and they will help it back. Let’s look how it is made. The second thing you need is to create twitter app on account, which your bot will use to communicate with its followers. It will grant you access tokens, which you need to connect to twitter API. I used Twitter Lib for Google Apps Script to simplify the communication with API. It allowed me to tweet and get tweets with questions easily. You just need to call the right function with some arguments. That was the tools that I used. But how did I make it work? I will describe the general idea now. I set App Script project to run my code every minute. The code does basically two things. 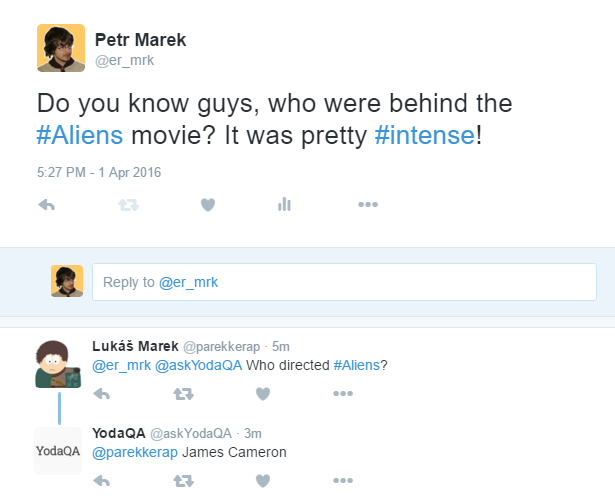 The first step is to obtain answers from twitter and to ask YodaQA. Bot searches all tweets with @askYodaQA. It saves the users that tweeted them and the time when it found the tweets. Then it sends the text of the tweet to YodaQA. 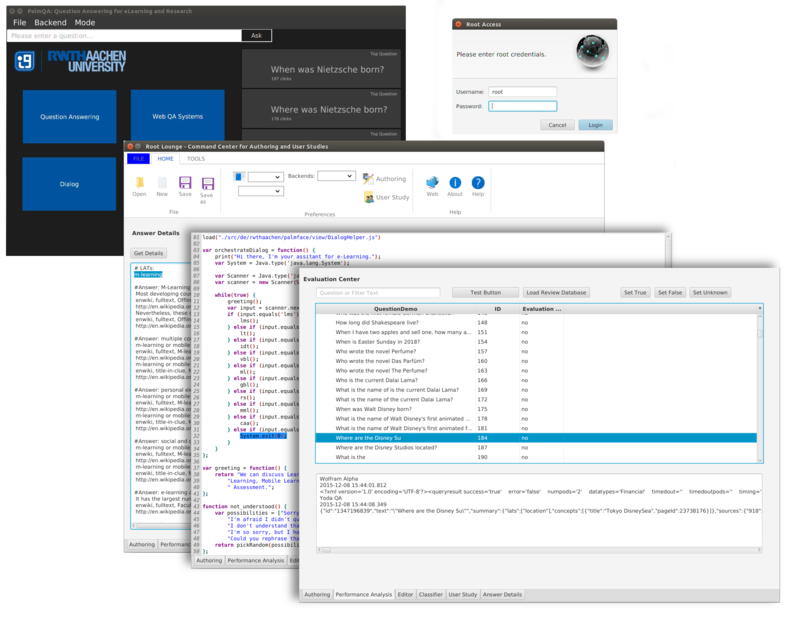 YodaQA replies with dialog id and question id, which it saves to the list of questions. The second step is to go through list of questions and to ask YodaQA for answers to these questions. Bot sends questions to users as soon as the answers are finished. You can even rely on features of the Hub, such as dialogs and coreference resolution. Two questions are connected to dialog when they are asked within five minutes interval. I said that I save some information. Where? I used spreadsheet as memory. I use one sheet as “user memory”, the second as “asked question list” and the last as memory for the id of the last served tweet. I even log some information into a Google Docs text document. It may sound simple (and it is simple), but it works. You can try it right now. Just tweet question with @askYodaQA and answer will arrive within few minutes. You can even use hashtags or mention other users. They will also receive the answer. You can see the whole code on GitHub. You can use it and modify it for your own twitter bots too, maybe on your own data? One of our great student interns at eClub/Ailao Petr Marek who also made the current YodaQA web interface is now working on adding a new element to our ecosystem – the Hub. This is an interface between the web app and the YodaQA system which takes care of various tasks that don’t fit a “pure question answering” system well. For example, it tracks dialog context or allows domain-specific question handling (if you want to add support for retrieving current traffic information, TV schedules or custom question transformations). We see voice (and chat) as the perfect fit for question answering systems like YodaQA, and together with this, dialog comes naturally. This is why Petr M. has recently transformed our live QA interface to the dialog format (and it now goes through the Hub). The dialog tracking is internally still relatively simplistic from a scientific point of view, but it’s more than enough to already create a great impression. 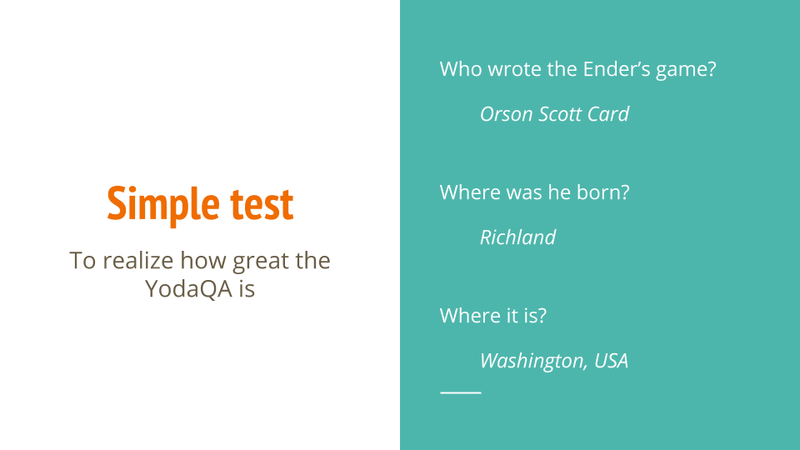 And right now, in a simple, tongue-in-cheek informal test, YodaQA does great compared to “competition”! We have our mice TV now streaming our colony of mus minutoides at the canonical URL http://mice.or.cz/ but it would be nice if you could watch them in your web browser (without flash) instead of having to open a media player for the purpose. I gave that some serious prodding. We still use vlc with the same config as in the original post (mp4v codec + mpegts container). Our video source is an IP cam producing mp4v via rtsp and an important constraint is CPU usage as it runs on my many-purpose server (current setup consumes 10% of one CPU core). We’d like things to work in Debian’s chromium and iceweasel, primarily. Media server nginx-rtmp-module (in my case with pull directive towards the ipcam’s rtsp) with mpeg-dash output and dash.js based webpage. I might have misunderstood something but it might actually just work (assuming that the bitrate negotiation could always end up just choosing the ipcam’s fixed bitrate; something very low is completely sufficient anyway). Debug libogg + libtheora to find out why it produces corrupted streams – have fun! So I didn’t get around to seriously (besides running a few examples) play with Keras (a powerful library for building fully-differentiable machine learning models aka neural networks) – until now. And I have been a bit surprised about how tricky it actually was for me to get a simple task running, despite (or maybe because of) all the docs available already. The thing is, many of the “basic examples” gloss over exactly how the inputs and mainly outputs look like, and that’s important. Especially since for me, the archetypal simplest machine learning problem consists of binary classification, but in Keras the canonical task is categorical classification. Only after fumbling around for a few hours, I have realized this fundamental rift. The examples (besides LSTM sequence classification) silently assume that you want to classify to categories (e.g. to predict words etc. ), not do a binary 1/0 classification. The consequences are that if you naively copy the example MLP at first, before learning to think about it, your model will never learn anything and to add insult to injury, always show the accuracy as 1.0. Pass output_dim=1 to your final Dense layer (this is the obvious one). Use sigmoid activation instead of softmax – obviously, softmax on single output will always normalize whatever comes in to 1.0. Pass class_mode='binary' to model.compile() (this fixes the accuracy display, possibly more; you want to pass show_accuracy=True to model.fit()). In IPython, do not forget to reinitialize model = Sequential() in some of your cells – a lot of confusion ensues otherwise. Keras is pretty awesome and powerful. Conceptually, I think I like NNBlocks‘ usage philosophy more (regarding how you build the model), but sadly that library is still very early in its inception (I have created a bunch of gh issues).